Welcome! We offer a variety of free programs for children that support and enrich their learning experience. We have weekly drop-in programs ranging from early literacy through school age, as well as special registration programs through the year. In addition to programming, we welcome you to visit our parenting collection and other educational resources in our Children’s Room. These programs are great for our littlest readers or pre-readers! They happen every week and registration is not required. Enjoy songs and playtime with your baby while building early literacy skills. No registration required. For ages 12-24 mos. Mondays 10:00 a.m.
An early literacy lap sit class that introduces books, nursery rhymes and songs. No registration required. For ages 12-24 months. Fridays 10:00 a.m.
An early literacy class that combines nursery rhymes, stories, songs & music activities to promote lifelong learning. Wednesdays 10:00 a.m. For ages 18 mo. – 4 yrs. old. Introduces children to lengthier books. Participants explore a different non-fiction subject or story each week. Class promotes group discussion while encouraging independence. For children ages 7 & up. A creative art class that teaches active listening, inspires creativity, and develops fine motor skills with hands-on crafts. Wednesdays 6:30 p.m. For ages 4-8 yrs. old. 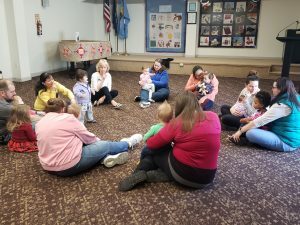 An early literacy class that engages children in active listening promotes motor skills & literacy development with shared books, felt board activities and songs. Thursdays 10:00 a.m. For ages 2-3 yrs. Old. A fun and educational after school program for children in 4th and 5th grades, 3:30 p.m. – 4:30 p.m on Fridays during the school year. Children will be given a light snack. Bus transportation provided from Center School to the library. Check the event calendar for specific listings.